known as Little Chelsea where many of the houses have been declared National Monuments. The Coach House is a converted original building in a quiet corner of our garden. It is in easy walking distance of shops, parks and several highly rated restaurants. A separate entrance through the garden leads to the guest cottage, which is double-storey and fully equipped as self-catering accommodation. From your own private patio you enter the double volume sitting/dining area. On the left is the kitchenette which is fully equipped. Off this is the bathroom (shower only). A wooden staircase leads to the open-plan bedroom under pitched roof, which sleeps 2 adults comfortably. There is an adjoining gallery with single bed for an additional adult or child (over 5 years). For your convenience The Coach House provides tea, coffee, milk, fruit juice, fresh fruit and biscuits on arrival. Wynberg with its mountain backdrop is conveniently situated between central Cape Town and a number of Cape Town’s beautiful, sandy beaches. It would take less than 15 minutes to reach either destination and in 10 minutes you could be on the Constantia Wine route or at Kirstenbosch Botanical Gardens. 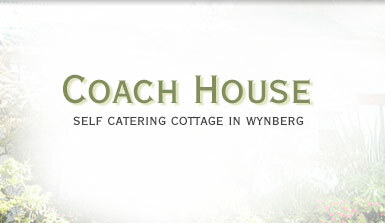 The Coach House provides a tranquil and friendly environment from which to explore the beauty of the Western Cape.